Dimensions 2 by 6.25 by 9.25 in. Describing all of Colombia's birds, Steven Hilty and William Brown bring together information on one of the world's largest avifaunas-nearly 1,700 species. Over half of all the species of birds in South America are included, thus making the book useful in regions adjacent to Colombia, as well as in the country itself. The primary purpose of the work is to enable observers to identify the birds of the region, but it also provides detailed species accounts and will serve as an important handbook and reference volume. Fifty-six lavish color plates, thirteen halftone plates, and ninety-nine line drawings in the text illustrate over 85% of the species, including most of the resident birds. Notes on the facing-page of each place, and range maps of 1,475 species, facilitate identification. Written with the field observer in mind, the text gives special attention to comparisons of similar species, transcriptions of voices, and comments on behavior, status, and habitat. It also provides ranges, breeding data, and references. Notes outline taxonomic problems and briefly describe species that eventually may be found in Colombia. Introductory chapters and photographs highlight Colombia's geography, climate, and vegetation, and discuss migration and conservation questions, and the history of Colombian ornithology. Appendices contain a large bibliography, a section on birding locations, and coverage of two of Colombia's far-flung island territories, Isla San AndrÃÂ©s and Providencia. Maps depicting vegetation zones, political boundaries, national parks, and the most text localities are included. 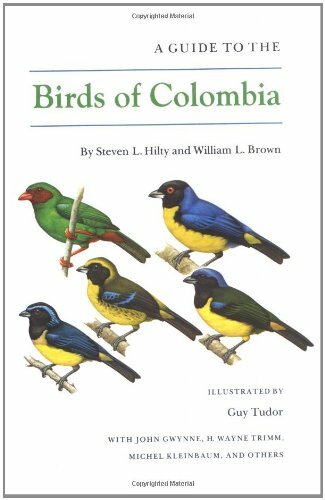 About: Describing all of Colombia's birds, Steven Hilty and William Brown bring together information on one of the world's largest avifaunas-nearly 1,700 species.